Standing at four feet 10 inches tall, Sister Paschal Cheng has found success in her religious life amid her small stature, which some might think would be a hindrance. Her Franciscan Sisters applaud her bravery and resilience in her lifetime of work in being a healing presence to those she serves. 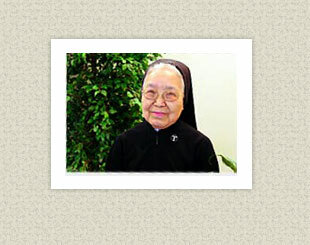 Over her 62 years in religious life, Sister Paschal has served here at the Motherhouse, St. Elizabeth’s Hospital (Belleville, IL), St. John’s Hospital (Springfield, IL) and at the Sisters’ mission, Star of the Sea Clinic, in Kaoshiung, Taiwan. While in Taiwan for more than 15 years, Sister Paschal ventured out into the city to seek those in need and encourage them to visit the clinic. She went door-to-door in hopes of bringing hope to those who suffered and sharing a bit of sunshine to brighten the day. Our American Province sponsored this mission from 1968-2002. Born August 7, 1919, in Ho Pei Tsao, China to John and Martha Ho Cheng, Sister Paschal was named Mary. There were seven children in her family: five boys and two girls. As a young woman, Mary worked with the Hospital Sisters at St. Joseph’s Hospital, Jinan, China. “I was very impressed by their piety and happiness, and I wanted to be like them and to work for the Lord,” Sister Paschal said. When the Communists began to take control of China, the Sisters were forced to leave their homeland because they were Christians. “My Religious Community felt that we would be safest in America. We arrived in Springfield on June 5, 1948,” she explained. She began her work in the Motherhouse sewing room with Sisters Sylvia and Coelestis. “They were so patient and kind, and they taught me English, although they were German,” she said. “To those who read my story, I encourage you to always remember my favorite psalm, Psalm 23: ‘The Lord is my shepherd, there is nothing I shall want.’ These few words remind us that that God always near,” she explained.